Alyssa Hollingsworth is a newly published middle grade fiction author (and one of the kindest people I've worked with!). As she prepped for the release of her first book, The Eleventh Trade, we worked together to uncover her brand story and develop a flexible branding system. The final brand features a versatile brush lettered type in combo with hand drawn icons and patterns and clean typography. Here's a snapshot of the final brand. 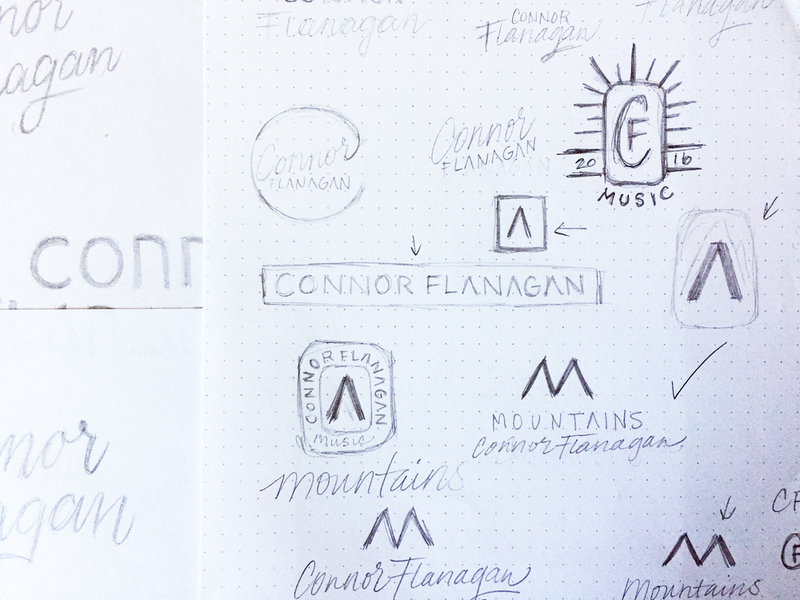 I recently had the opportunity to work with Connor Flanagan, a Minnesota based hip hop artist, on recreating his personal brand and developing artwork for his upcoming hip hop debut album, Mountains. Connor is super talented and has a really genuine, compassionate vision for his music. He was very open and flexible to my creative suggestions, and I love the results of our collaboration. The final brand includes a mix of authentic brush script and a clean, modern block type. The goal was to create something versatile that combined the bold and modern with the urban and personal qualities of Connor's work. Along with the dominant brush script branding, the branding system includes an alternate version in the custom sans serif block type. The graphical "A" is also used as an independent icon. As I do with all my custom branding projects, I started first with rough sketches and a lot of brainstorming. You can see below the concepts in their infancy, along with a few ideas that didn't make the cut. As we progressed, I picked up my favorite brush pen and tried a variety of styles before we found the one that hit the mark. This same brush style was carried over into other elements of the brand, including a custom X pattern and some website graphics. All created by hand. Here's a small sampling of the custom website graphics created using the new branding elements and custom typography. 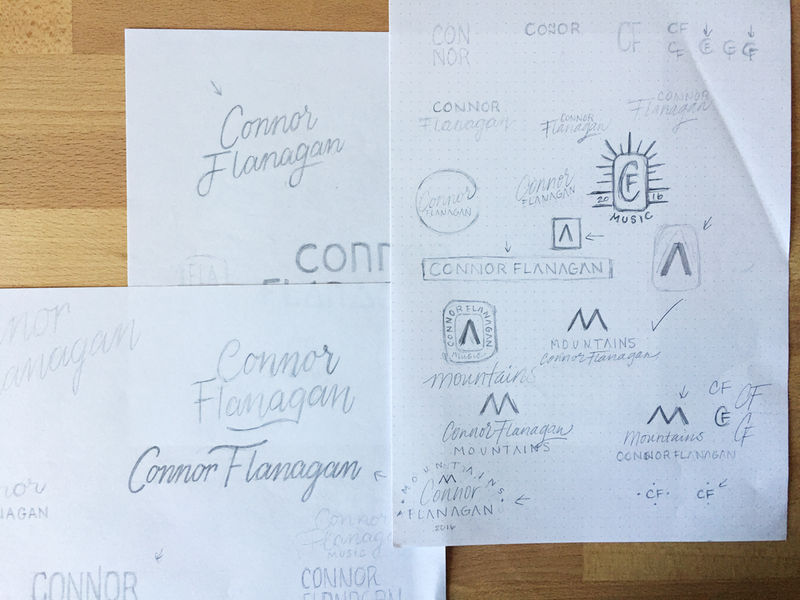 I really enjoyed hand crafting this brand for Connor and can't wait to see how it grows and develops over time. Here's a snapshot of the complete project which includes the brand color palette, album artwork, icons, and product. If you're interested in collaborating on your branding project, drop me a line. I've just finished up a very enjoyable branding project for the ladies over at Meadowbelle. Erin & Aundrea are twin sisters who own Meadowbelle Market and Meadowbelle Weddings, both Etsy-based retail shops with handmade jewelry and wedding accessories, respectively. I love how delicate and beautiful their work is, from one-of-a-kind hair pieces to their oh-so-popular stacking rings. When they came to me, their branding was a mix of elements they'd collected over the years. They pulled inspiration from vintage drawings and lettered brands, but were in need of a strategic brand refresh that could provide consistency and versatility, while embracing their unique style. The final brand includes the hand lettered wordmark "meadowbelle" which acts as the base of the brand. Each business line then has a unique logo which can be used in a variety of ways with the line art elements and icons. The Meadowbelle gals wanted the ability to switch up elements of the logo as needed, and requested hand drawn elements to represent the seasons. The final grouping includes a couple extra (because, who can choose just a few!? ), and all the icons work together to provide a consistent feel across the brand. These icons will also be used for packaging, stationery, and other pieces. One of my favorite pieces of the brand is the hand lettered script "M" icon. This icon holds a special meaning to Erin & Aundrea because it includes a hidden "A" and "e" to represent their names within the Meadowbelle "M". I love that they came to me with this idea, and I'm glad I was able to come up with something beautiful that complements the brand. I had such a great time creating this brand and I look forward to working more with the ladies of Meadowbelle. Here's your peak into the new Meadowbelle branding. I can't wait to hear your thoughts! When I first sat down to concept ideas for my new business cards, I wasn't entirely sure where I'd take it, but I knew I wanted to do something custom and fun. Following my typical process, I did some word brainstorming, then a little rough sketching before narrowing in on the designs. I stuck mostly to hand drawn lettering, but wanted to include a couple of quotes that applied to my work and include some surface patterns (in the end I only used one pattern in this round, but more to come next time). I was quite happy with the results, so much so that a few of the designs have made their way onto product in my shop. Below are some photos of the work. If you'd like to talk about how I can help you with a project like this, drop me a line. NEW Digital Assets - plus FREE Downloads! ©2018 Jonelle Jones & Jonelle Jones Creative Studio LLC.